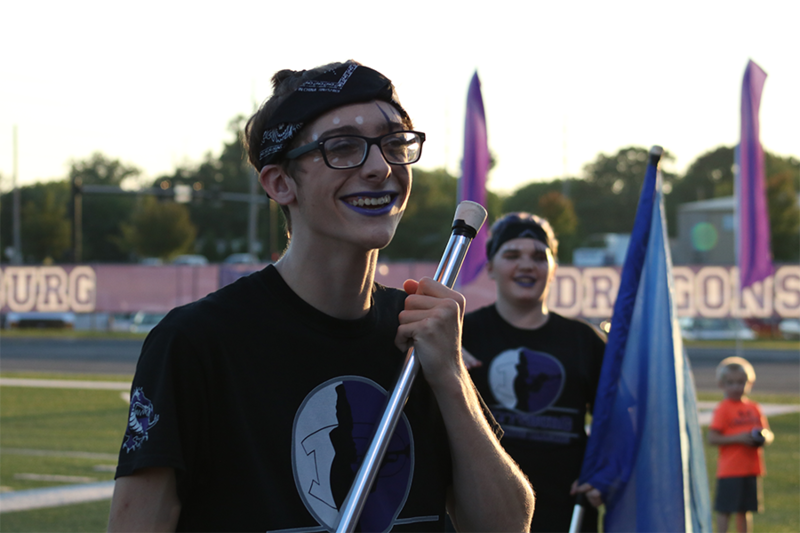 ABOVE: Junior Dominic Hyatt (front) and sophomore Lane Phifer (back) smile in front of the crowd before their halftime show at the Dragons' football game last week against Blue Valley North. Hyatt and Phifer are the first males to join color guard since it was reintroduced in 2014. The sound of the fight song filled the air at Hutchison Field minutes before the start of last Friday night’s football game against Blue Valley North. The football players laced their cleats and tossed the ball to warm up. The band members played through their songs in the Pittsburg Community Middle School (PCMS) gym, moving their feet to the beat of brisk Disney music. But in the girls’ restroom beside the band, sophomore Lane Phifer — one of two boys on the color guard team — faced another task. He was sketching out claw marks on his eyes and filling them in with dark purple eyeshadow, imitating a dragon. He ran around the room, doing the same for all of his teammates. Phifer and his boyfriend, junior Dominic Hyatt, are the only boys to join color guard since it was reintroduced in 2014. Color guard is now a daily part of Phifer and Hyatt’s school days, but joining the team wasn’t an immediate decision for either. Phifer came out as transgender the summer before his freshman year. He tried to stay away from activities associated with femininity — color guard was one of those things. Hyatt, on the other hand, tried out color guard his sophomore year, but simply couldn’t imagine himself doing it. But as soon as he saw the flags snapping in the wind at Friday night halftime shows, he changed his mind. Phifer decided he would join after spending his study hall periods watching his friends on the color guard team practicing. When Phifer and Hyatt joined the team, they were welcomed with open arms. Color guard sponsor Nicole Gilmore said she was ecstatic to have a diverse team after predominantly having girls in the past. The other girls on the team — longtime friends of Hyatt and Phifer — said they’re proud to work with their friends, and watch them break gender barriers. But being the only males on the team doesn’t stop Hyatt and Phifer from wearing as much makeup as their female counterparts, or twirling their flags as fast — or as high. Regardless, Phifer and Hyatt said the work they put towards color guard comes from passion, and that gender doesn’t have a role in it.